*Available exclusively on Apple TV. 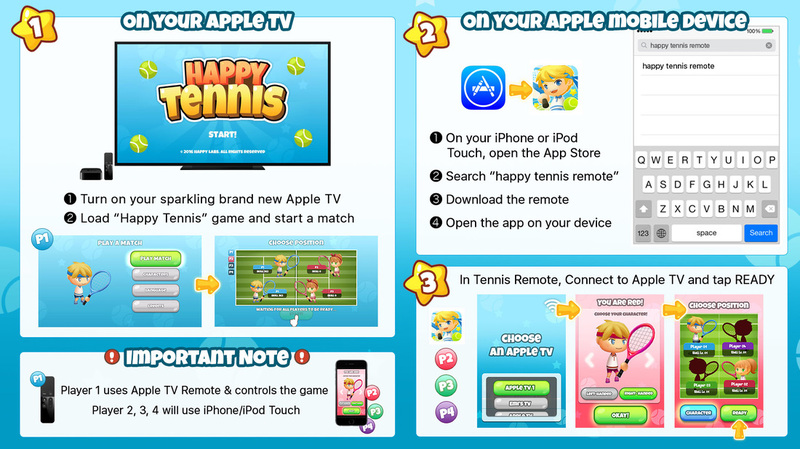 Search and get Happy Tennis on the Apple TV App Store! ​Get ready for a smashing-good time with your friends! Swing your remote to launch volleys and perform Smash & Dive maneuvers! Single Player: Use the Apple TV Remote to play solo! Connect your friends’ devices to the game & play together. Click here to download Happy Tennis Remote App for multiplayer! Smash your way to victory! Launch volleys and gain your advantage! ​Play with up to 4 friends in real time! Get it NOW from the Apple TV App Store! Search Happy Tennis in the Apple TV App Store. To request for promo codes, please contact us at support@happylabsfree.com.